Presenting online means to play a PowerPoint presentation on your Mac for others to watch it over the Internet. As you go from slide to slide, audience members see the slides on their web browsers. Presenting online is an excellent way to show a presentation to others during a conference call or to others who don’t have PowerPoint. Presenting online is made possible by the PowerPoint Broadcast Service, a free service for everyone who has Office software and an Office 365 account. The first time you attempt to show a presentation online, you are asked to provide your Office 365 username and password. The PowerPoint Broadcast Service creates a temporary web address for you to show your presentation. Before showing it, you send audience members a link to this web address. Audience members, in turn, click the link to open and watch your presentation in their web browsers. Before presenting online, make sure you know the email addresses of the people who will view your presentation. Make sure as well that they are available to view it. Online presentations are shown in real time. After you close a presentation, its link is broken and the audience can no longer watch it in their web browsers. On the Slide Show tab, click the Broadcast the Slide Show button. The Broadcast Slide Show dialog box appears. You can also open this dialog box by choosing File→Share→Broadcast Slide Show. If you’re not signed in to Office 365, provide your username and ­password in the Windows Live Sign In dialog box. The PowerPoint Broadcast Service generates a URL link for you to send to the people who will view your presentation. 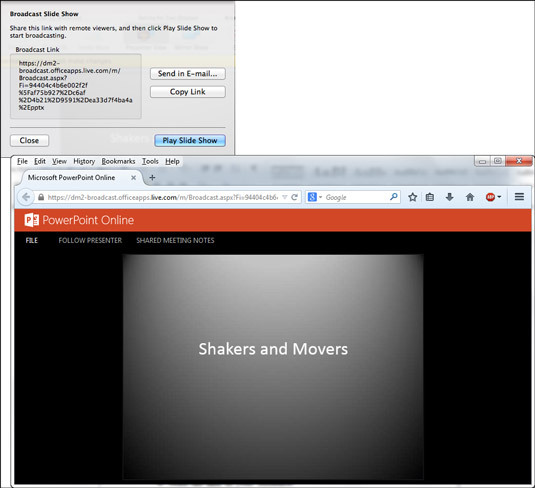 Others can click the URL link (top) to view an online presentation in a browser window (bottom). Send the link to your audience. You can send the link with Outlook or another email software. Copy and send the link by email: Click Copy Link to copy the link to the Clipboard. Then, in your email software, paste the link into invitations you send to audience members. Send the link with Mail: Click the Send in Email link. A Mail message window appears. Address and send the message. Make sure that audience members have received the email invitation and are ready to watch your presentation. Click the Play the Slide Show button in the Broadcast Slide Show dialog box. Audience members see the presentation in their browsers. Use the same techniques to advance or retreat from slide to slide as you use in any presentation. When the presentation ends, you land on the Home (Broadcast) tab. On the Home (Broadcast) tab, click the End button; then click End Broadcast button in the confirmation dialog box.